The APQ-3HD is the optional accessory package for the Q3HD Handy Video Recorder that features an array of accessories that will make your HD movies even more pristine and easier to capture. 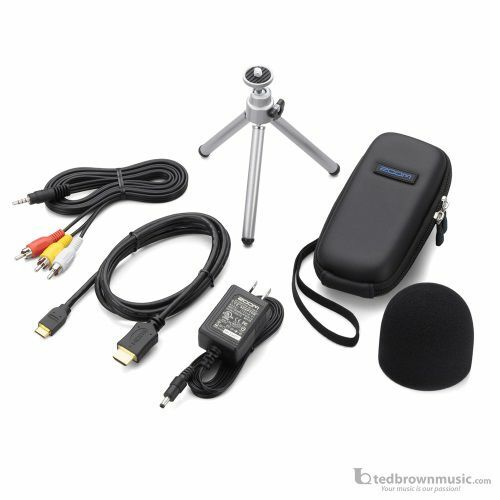 The kit includes a soft shell case, windscreen, AC adapter, HDMI cable, AV cable and an adjustable tripod mount. Utilize the APQ-3HD's soft shell case to protect the only handheld camcorder that does it all in 1080p. The kit's windscreen will reduce the occurrence of wind, breath sounds and popping noises in your movies. Using the package's AC adapter to charge your Q3HD is easy and convenient. The included HDMI cable enables you to watch your movies at home on your HDTV. Lastly, the APQ-3HD's adjustable tripod stand makes the Q3HD versatile in a variety of stationary functions.